We chatted to Emma Spengler from Design Consultancy about the design of the Doppio Zero, Blue Hills. How would you describe the style?The key design intent of this concept was to create a space that is casual and comfortable. It does not necessarily follow a particular style, it had to more importantly, answer to the requirement that a shop should be comfortable to sit in, even if it’s not full. The different finishes and furniture items should create talking points and intrigue. Rather than sticking to a few details there are various design elements and details that tie into each other to create a very rich and dynamic space. The life or death of a design is always in the small details. 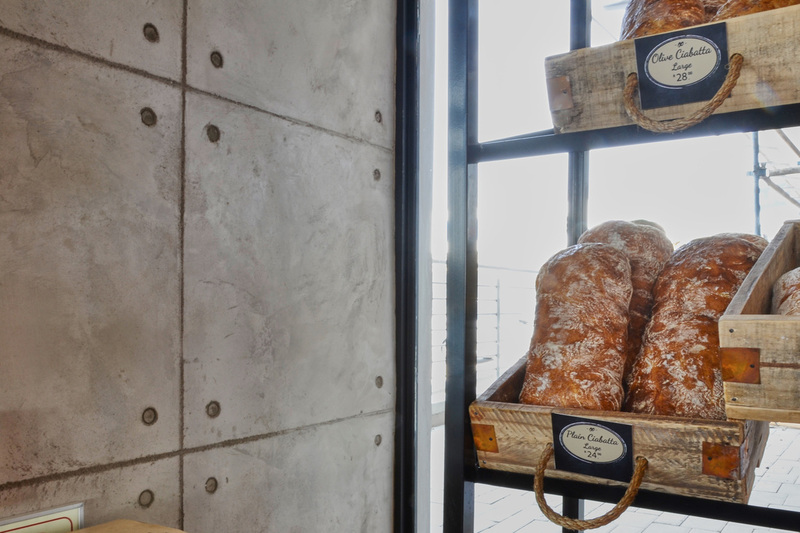 Why did you specify Cemcrete off shutter CemPlaster?After using the wall product at another branch of Doppio Zero (Hazeldean in Silverlakes Pretoria) we were impressed with the end result and also the affordability of the product. The name off shutter originates from a raw concrete look left after the shuttering, wood in planks or strips used as a temporary structure for fencing to contain setting concrete, is removed. CemPlaster in the colour Pavilion Grey was used to create the off shutter feature walls. CemPlaster is a coloured (available in a range of earthy colours) interior and exterior plaster-on wall coating that creates an attractive mottled finish and adds some texture to the surface. What makesCemPlaster the perfect product to create the off shutter look is that the blocks are created on site while the coating is still wet, allowing you to create blocks in the size and shape that you want. The blocks are imprinted into the wet CemPlasterusing a premanufactured mould. The latest in trendy Doppio Zero style coupled with only the freshest and finest ingredients. A wonderfully relaxed ambience and modern décor awaits you at Doppio Zero, Blue Hills.